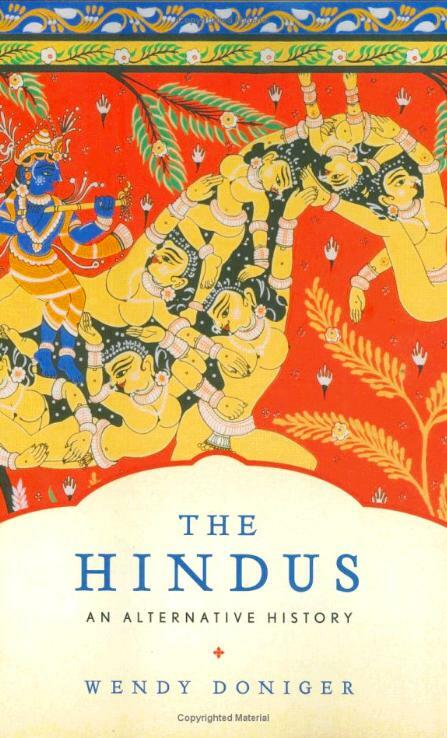 Have you been following the controversy over Wendy Doniger’s recent book, The Hindus: An Alternative History, published by Penguin? It is now being reported that the publisher has agreed to withdraw and pulp the book, in the near future, due to a 2011 court case in India, arguing it was insulting to Hinduism. The company made the decision in response to a case filed against it in 2011 by Dina Nath Batra, the convenor of the Shiksha Bachao Andolan, which describes itself as an educational institution, and five other people. Batra claimed that the book had been “written with a Christian Missionary Zeal and hidden agenda to denigrate Hindus and show their religion in poor light”. That there seems to me good evidence for a fairly recent (largely colonial-era) invention of the thing that people the world over now take for granted as this self-contained, ancient thing called Hinduism (let alone any of the other things that we today know as the world’s religions — so this applies to them all), yet people are fighting vehemently for the integrity and autonomy of it today, is something that surely deserves far more study. For it seems that we have here powerful evidence for how legacies from the colonial era — such as how to organize and name populations — have so successfully been reproduced and adopted that they now provide the very ground upon which people worldwide think themselves into agency and thus identity. But what I think is even more interesting is how nicely this represents the thesis that knowledge and power constitute one indissoluble complex — a thesis much associated with Michel Foucault, of course, but one also adopted by many in academia as well. Taking this thesis seriously, and of course recognizing that there are a variety of (often competing) interests and discourses that constitute any one social site, means that this is best understood not a case of so-called Hindu fundamentalism triumphing over disinterested scholarship (as, no doubt, many scholars and media outlets in North American or Europe will portray this case); instead, it means that we have here an occasion — happening in real time, right in front of us — of (1) how organized social interests determine what gets to count as information worth learning and reproducing and (2) how what counts as the past is a construct of competing interests in the present. That is, what do we make of this if we take Foucault’s thesis seriously, thereby seeing not just the author and her detractors but also ourselves, and our representations of the case, its disputants, and this thing Hinduism as well, as being just as deeply implicated in the contest as any other? There are still copies for sale at Penguin’s site, linked above, and a variety of used editions for sale at amazon.com; while this is surely not the last controversy over identity and representation, it is one of sufficient consequence, taking place right in our own field, that you may wish to read the book for yourself. If so, you better get your copy soon. See my colleague’s thoughts on this same controversy. This entry was posted in Faculty Blog, Religion in Culture and tagged Discourse, Fundamentalism, Hinduism, Identification, Identity, Knowledge/Power, Michel Foucault, Penguin Books, Wendy Doniger by Russell McCutcheon. Bookmark the permalink. While I do not quarrel entirely with your re-description (above) of the Doniger affair, it seems to me to evade the issue, put in terms of clichés, such as ” Hindu fundamentalism triumphing over disinterested scholarship.” Why be so shy of calling out the interests, even while recognizing that they are “competing interests”? One does not exclude the other. Located politically and historically, the Indian success at getting Doniger’s book pulped, is the act of those ‘interested’ in privileging their own hegemony (shades of Foucault)over intellectual discourse. Would Doniger do that? We all doubt it. So, call it what you will the position of Doniger over against those who blocked her book is pretty stark, and not to be relativized as you have. Why be shy about this, then? Of course we have interests at stake. This is not news. So, the old liberal stereotype of fundi vs detached scholar may in the end turn out to be truer — and far more historical — for all its creaky archaic ring than your cool relativizing of it.That kind of relativism, and it seems just that, which your view entails recalls an early characterization of a goodly part of post-modern ideology: “Entertaining at a party; useless in a struggle.” And, moreover, your ability to make the claim (above) that you make is precisely what is at risk at the hands of the likes of Doniger’s Indian censors. We are not amused. Nor, should you. In this sense, moreover, your treatment of “Hinduism” likewise fails to confront the fact that even if — as a “religion” — it was a Western “import,” the native folk now think in those terms as well. What were once exclusively “Western” categories (at least in historical origin) are “theirs” as well. In much the same way, we in the West now think in the Indian and Arabic categories implicit in algebra. What your (and Asad’s) fixation on the origins of categories cannot allow is that all cultural imports are not “impositions” or unfitting. Some imports, like the Japanese car you may drive, are desirable or welcome “imports.” Cultures change by consuming the goods AND categories of other cultures. Ivan–indeed, the fascinating thing is how the so-called Other can’t but think him/herself into agency but by means of a discourse from the 19th and 20th C (“nation” being foremost among them), developed first in Europre and then perfected in North America. I’ve written about this, of course (and I see myself as rather different from Asad’s approach, to be frank), and you are correct to point out the rich irony here–which means, to me, that scholars, despite their books being criticized, banned, or burned, have (unwittingly, perhaps) won the war if not any particular battle, akin to the US now owing so much money to a China that embraces a US inspired capitalism in a way we never would have imagined not so long ago. As for being shy, not me. The only problem here I think with your implication, citing the west, is that the adoption of categories and institutions and systems of thinking such as my example of the western adoption of algebra, do not seem to mean necessarily in any direct way related to power. The emphasis I’m trying to make is that this is really not so much about postcolonial situations nor does this situation really lend itself to postcolonial theorizing. Indeed we might begin to think about a post postcolonial theorizing as the actors in Kenya, Uganda Nigeria and Zimbabwe and their attacks on gays have make us rethink what is timely theorizing. I think you load the language here by saying the Other “can’t but think him/herself into agency.” Yes, it is a FACT that they do, but that doesn’t entail the determinism in your remarks. Maybe, they just LIKE doing so, as we like thinking with Hindu algebraic notions? Or, one could go pragmatist, and suggest that thinking this way “works” better? Our job would then be to understand why that way of thinking “works” here, there and maybe everywhere in advanced (sic) societies?